(Manama) – The fourth edition of the eCommerce Forum and Exhibition 2017 for trading establishments was opened under the theme “eCommerce … Bahrain Platform … for a Global Market” at the Crown Plaza Hotel. The event was inaugurated by Undersecretary of Commerce Affairs Nader Al Moayyed on behalf of Minister of Industry, Commerce and Tourism Zayed bin Rashid Alzayani. This year the event was held in a strategic partnership with Tamkeen and Bahrain Technology Companies Society (BTECH), and silver sponsorship from Gulf Petrochemical company. On this occasion, undersecretary delivered a speech stressing the importance of raising awareness about electronic transformation among small and medium enterprises by combining the latest technical solutions in terms of cloud computing. In this regard, Al Moayyed highlighted the latest eCommerce statistics in the region. Quoting the report by eCommerce Foundation, he pointed out that the turnover of the B2C global eCommerce transactions has doubled in the Middle East and Africa region for 2016 to approximately $26 billion, with 150 million Internet users in the region for the same year. In contrast, the growth rate of global eCommerce among individuals and enterprises is estimated at 17.5% Dollars. For his part, Tamkeen Chief Executive Dr Ebrahim M. Janahi stressed the importance of supporting initiatives aimed at promoting the commercial and economic prosperity in Bahrain. 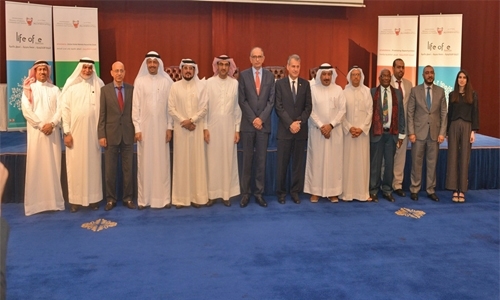 “Tamkeen, as a strategic partner in this Forum, stresses its role in providing the Bahraini market with all the required components of sustainability and competitiveness to level it up to highest international standards and actively contribute to the realisation of Bahrain Economic Vision 2030,” Dr Janahi added. The Chief Corporate Services Officer Dr Yusuf Ahmed Dashkooni praised the objectives of the Forum in spreading the culture of eCommerce. The meeting also emphasised the need to establish an Echo System capable of efficiently keeping the Bahraini market alongside developments in the eCommerce market, including the shift from traditional practices to those based on cloud computing. Panels discussion focused on the future of eCommerce and efforts to support entrepreneurs and businesses by helping them to launch their work locally and globally. In the first discussion, Khaled EL Shabrawy, Cloud Solutions Lead for Public Sector from Microsoft Gulf, talked about the role of modern technological means to promote eCommerce. The discussion was moderated by Dr. Abdul-Hussain Al-Deiri, Chairman of the Association of Small and Medium Enterprises in Bahrain. Amal Al Mudaifa Product Marketing Manager in Data Centre and Transactions in Batelco and Dr. Abdelgadir Warsama Ghaleb legal consultant and professor in the university also spoke on the occasion. The second panel discussion, moderated by Abbas Hussein, Director of Digital Middle East, dealt with the topic of business accelerators. This was presented by Mohamed Al Tawash Managing Director Founder & MD from Corporate Hub CH9. The most successful stories in this field were presented on the occasion. In this context, Ahmed Abdulnabi Ali, Head of Technical Support and eServices from the Ministry of Industry, Commerce and Tourism, discussed the recently launched virtual trade records under the title “SJILI”, which supports and encourages small-scale enterprise projects and certain types of business activities that can be carried out without the need for a physical office. The forum concluded with a series of recommendations and constructive suggestions. A mini exhibition was also held, where the most relevant services of digital transformation were displayed.